Our role is to find solutions to some of the difficulties that visually impaired individuals face. Of course we can’t supply every machine, but we do pride ourselves on our ability to find the compromise between the best machine at the most efficient price. In 2018 we attended Sight Village in Birmingham to assess the latest new technology, equipment and products. 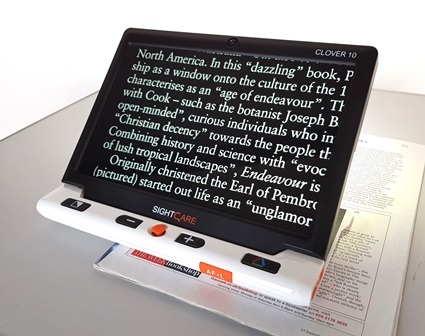 In November 2018 we took delivery of a Clover 10″, a hand held portable magnifier similar in size to a tablet; with its own carrying case, it’s a great way to bridge the gap between portable and desk top machines. Please contact us for further information. This year we are attending Sight Village South West on 24th April 2019. We will have a range of our products available for you to try. We will also be able to discuss with you the benefits of renting equipment which means that you will have all the information that you will need to make an informed decision. This entry was posted on Wednesday, February 6th, 2019 at 3:14 pm	and is filed under Uncategorized. You can follow any responses to this entry through the RSS 2.0 feed. Both comments and pings are currently closed.